Orange Beach AL condominium home for sale at Tidewater. Spacious, open floor plan with floor to ceiling windows to show off the gorgeous white sandy beaches and pool views right from your quiet gulf front balcony! This cute beachy 1BR/1BA condo offers "clean as a whistle" everything from fresh paint, new sleeper sofa, new bed linens, to professionally cleaned and sealed tile floors throughout! Plus brand new water heater, microwave, self clean glass top stove, bar stools and less than 2 yr old dryer and hurricane shutters. A Secure Gated entrance, indoor and outdoor pools, spa, exercise room and sauna (all amenities to attract great rental potential), plus an affordable HOA, and huge parking area, all in one beautiful condo which is absolutely turnkey ready, making it a great place to live or vacation not to mention snowbirds love it - just bring your swimsuit and toothbrush and enjoy! 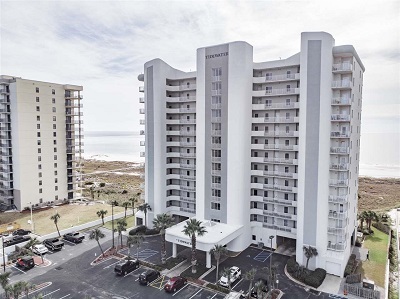 Visit: Tidewater Condos For Sale in Orange Beach AL.